The European shore crab is a 10-legged eating machine. It could devastate our shores and everything living there. shallow waters down to 60m. The European shore crab eats everything, including plants, algae, shellfish, crabs (even their own species), worms, and carrion. can collapse wild-harvest shell fisheries. This pest is most likely to arrive in New Zealand in ballast water from ships. MPI has strict measures in place to limit the chances of ballast water from international vessels containing unwanted pests. It could also hitchhike on the hull of a boat. Boats visiting our waters need to keep their hulls clean. Even if you don't travel overseas, keeping your boat hull clean can stop pests spreading. The features that make this crab unique. Three rounded "teeth" or lobes between the eyes. Five forward-facing spines on each side of the carapace (shell). An adult carapace of up to 8cm wide. Legs are smooth, spineless, and lack swimming paddles. Adult colour varies from green on top and yellowish underneath, to mottled red and orange above and orange or partly red underneath. 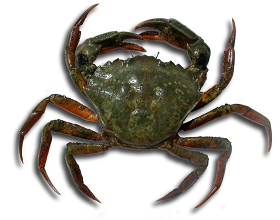 Adult European shore crabs vary in colour. Left: CC 4.0 Hans Hillewaert ; Middle: MPI; Right: A M Arias, Marine Biosecurity Porthole. Note: This information is a summary of the European shore crab's global distribution and potential impacts on New Zealand.